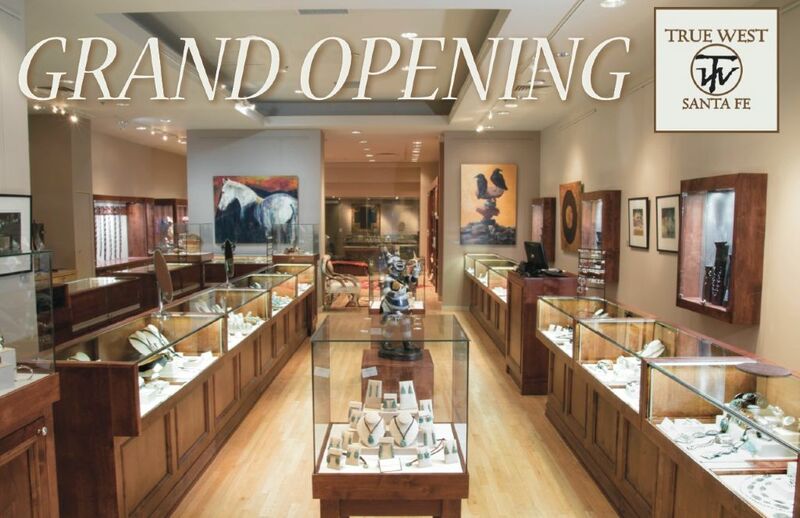 Just a quick post to invite you to visit True West Gallery at 130 Lincoln Ave in Santa Fe, NM. It’s just around the corner from the heart of Santa Fe (the plaza) and a half-block from the New Mexico Museum of Fine Arts. I am thrilled have been invited to be part of this distinguished and eclectic group of artists. 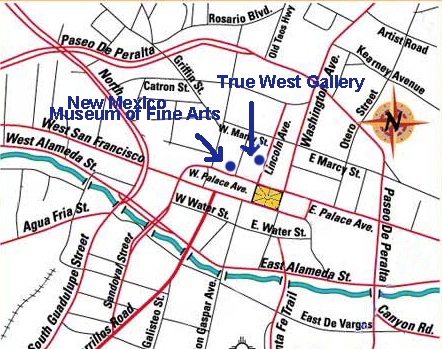 The True West Gallery and Fine Arts Museum are indicated by the blue arrows. The plaza is the yellow square in the center. It all happened very quickly when one of the gallery directors from True West saw one of my paintings in the home of a mutual friend. She had purchased the raven several years ago. He called me immediately and we arranged a studio visit for the next morning. I was still in the throes of preparing for Birds on the Brink, so the studio was in total chaos, but fortunately he could see through the debris and was able to choose several paintings. Among them was Balancing Act which you can see on the right in the invitation. 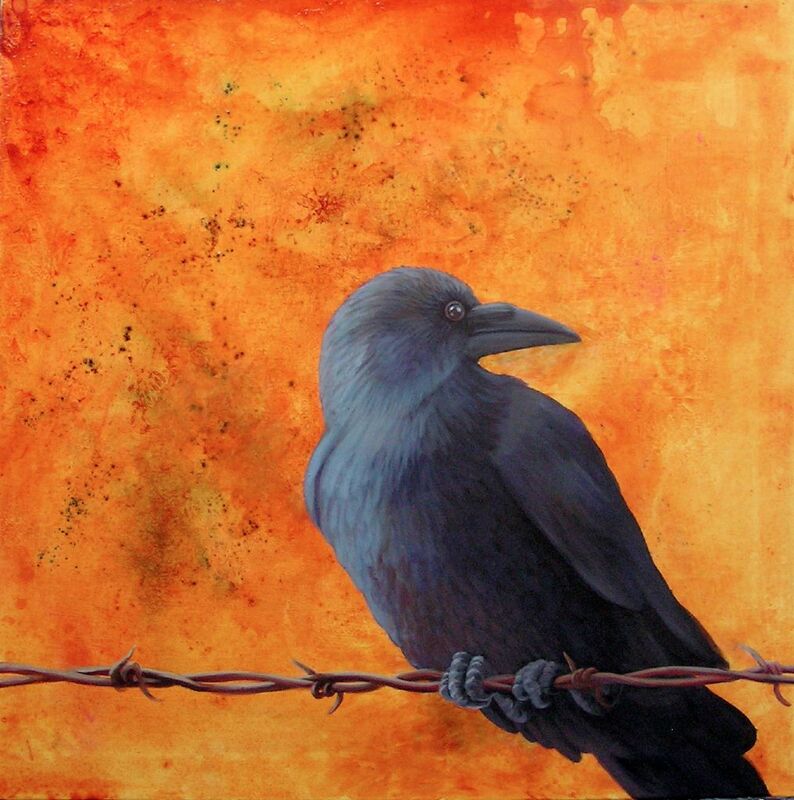 Raven on Barb Wire, acrylic on canvas, 24″ x 24″ This was the painting that generated the invitation to join the gallery. Please stop by True West to see fabulous art of many mediums: painting, of course, and weaving, sculpture, ceramics and more. Their jewelry selection is to die for. The Grand Opening is Saturday March 14. Their website is still in process, but you can visit them on Facebook.